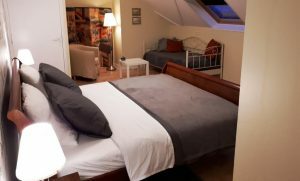 This vegan and gluten free B&B is located in the rural part of the beautiful Champagne-Ardennes in France. Only 3,5 hours drive from Calais and 4 hours from Utrecht this is the ideal vegan and gluten free getaway or stopover. In the midst of WWI and WWII battlefields, bunkers, memorials and cemeteries, ancient cities are just an hours drive away and the Argonne forest is just a short distance from the B&B. This place has everything you could wish for if you like peace and quiet. We’re an international couple with firm Dutch roots currently living in a one of the most beautiful and authentic regions of France. Born in Dordrecht, Zoran is of Yugoslavian extraction and Samantha is British, but she lived in the Netherlands for over 30 years. 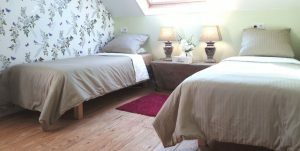 We have the pleasure in offering you a choice of one of four lovely rooms in our B&B or our self catering guesthouse next door. A delicious freshly made vegan and gluten free breakfast is included in the price of your room. Price is including tourist tax. All rooms have their own private bathroom en suite. Every bathroom has a toilet, a wash basin and a good size rain shower, as well as a hairdryer and vegan and gluten free amenities. In summer we have several seating areas in the garden where you can enjoy your breakfast or enjoy the lovely weather. In winter breakfast is served at our dining table. Free WIFI is available for our guests throughout the house and guesthouse. Since we are in the countryside there is no guarantee internet is always available. On the first floor is a large and comfortable sofa with shared seating area for our guests. Here you will find a small library with several books in French, English and Dutch for you to borrow. There is also a cupboard with a large array of board games for you to play. Although we have three big dogs and 3 cats of our own, pets are not allowed in the B&B. If you would like to bring your dog you are very welcome to stay in our guesthouse, but dogs are not allowed on the furniture.. If you like you can join us for a delicious, homemade, gluten free, vegan and if possible organic three course meal on a daily basis. Homemade food filled with love is the perfect end to a lovely day. The price is €25 per meal. Because we are a completely vegan and gluten free B&B we can not condone any food that contains gluten or meat in the house. We regularly have guests that may become ill due to cross contamination. Please leave these products in your car for use outside of the B&B. Our Rose room is approximately 19m2 and located on the ground floor. It overlooks the front garden and the private parking area. This romantic room has a lovely iron double bed of 160×200, which is made with high quality bedlinen. There is also a full size wardrobe with full length mirror and on the ceiling is a big fan to keep you nice and cool in summer. 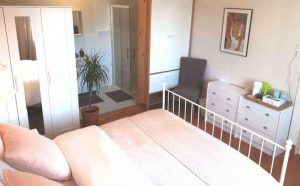 In the room is an open plan bathroom en suite with a private toilet, a washbasin and a good size rain shower as well as a hairdryer and vegan and gluten free amenities. Just outside the room is a separate toilet. 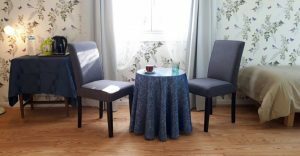 There are two chairs in the room, coffee and tea amenities are complimentary as is a fruit basket and a bottle of water. The size of the Bird room is 22m2 and located on the first floor. 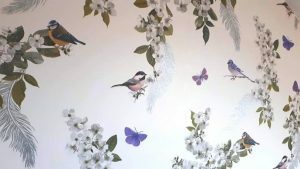 The room is suitable for 2 and has been decorated with beautiful wallpaper. There are twin beds of 80×200, which are made with high thread count bedlinnen, as well as a full size wardrobe. In the room is a bathroom en suite which has a private toilet, a washbasin and a good size rain shower. There is a little seating area, which overlooks the quiet village square and town hall. 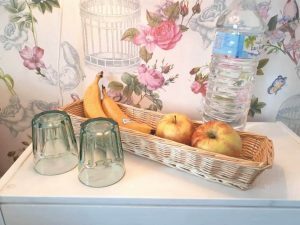 The coffee and tea amenities are complimentary as is a fruit basket and a bottle of water.. 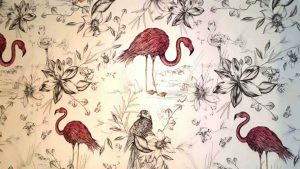 The Flamingo room is approximately 26m2 and located on the first floor. 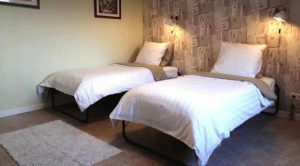 The room has twin beds of 80×200, made with high thread count bedlinen. There is a full size wardrobe with full size mirror, a bookcase and a secretaire. In your private bathroom en suite you will find a good size rain shower, a wash basin and a toilet. A hairdryer is at your disposal as well as vegan and gluten free amenities. There is a little seating area with a very comfortable sofa bed of 90×200, which sleeps a third person. The size of the very spacious Leaf room is 30m2 and located on the first floor. It overlooks the back garden and the forest beyond. This room has a very large bed of 180×210, which is made with high thread count bedlinen. 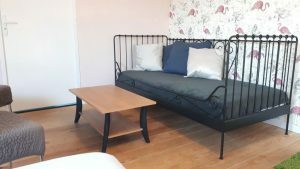 There is a wardrobe, a seating area with a comfortable chair and a sofa bed, which is suitable for sleeping a third person. The coffee and tea amenities are complimentary as is a fruit basket and a bottle of water. Next to the room is your private bathroom en suite. In the bathroom you will find a good size rain shower, a wash basin and a toilet. Our guesthouse measures 48m2 and has a private entrance. On two sides of the guesthouse is a private terras of about 60m2 which is completely fenced. Free parking is just outside the gate. The entire guesthouse has floor tiles, so it is easy to maintain. In the living room are French windows where we have created a French balcony. This way you can enjoy the view of the forest beyond. The living area has a very comfortable convertible sofa of 140×200 which is suitable for 1-2 adults or 2 children. 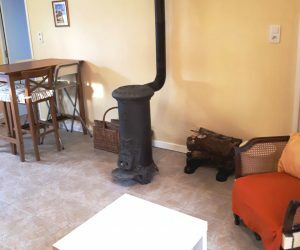 There is a high table and chairs next to the kitchenette where you can eat or work and there is an old fashioned wood burner. The wood burner gets really hot, which makes the guesthouse unsuitable for small children in winter. The bedroom has 3 single beds (one is 90×200 and two are 80×190), a wardrobe and a dresser. 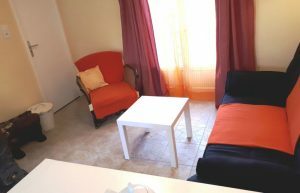 Bedlinnen, towels and kitchen towels are included and changed weekly, but may be changed more often at an additional fee. The kitchenette has a microwave, a fridge, a coffee maker and an electric kettle. Of course pots and pans, cutlery and crockery are at your disposal. Next to the kitchen is the bathroom which has a good size rain shower, a washbasin and a toilet. You will also find an iron, an ironing board and a rack for drying your laundry. We do offer a laundry service at an additional fee or you can go to Vouziers and use the laundromat. Barbecuing with meat is prohibited since we do not condone animal abuse in any way. The guesthouse is dog friendly, with a maximum of 2 dogs per stay, free of charge, as long as you clean up after them and don’t let them on the furniture. If you arrive with more dogs than agreed on there will be a fee of €10 per dog per day. There is a part of the garden reserved specially for the guesthouse, at the front and side of the guesthouse, which faces south and overlooks the village centre. There is garden furniture available for you to use during summer or on exceptionally sunny days in winter. 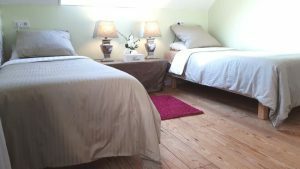 While staying in our self catering guesthouse we are happy to provide you with our optional B&B service at an additional charge. 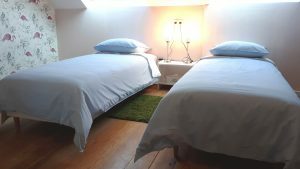 The service comprises of a delicious fresh and homemade vegan and gluten free breakfast, making the beds and changing sheets and towels every three days. € 12,50 per person per day. We can imagine that while on holiday you don’t feel like shopping, cooking and cleaning the dishes. The price is €25 per person per meal. The price for the Guesthouse varies per occupancy and duration, but you can save up to 45% discount per week! We both speak English, Dutch, French, German (Sam a little and Zoran almost fluently). Zoran also speaks Serbian- Croatian. Check-in time is from 16 h until 21 h.
Please inform us of your Estimated Time of Arrival. If you need to check-in between 12 h and 16 h you will need to ask in advance if this is possible. There is an extra surcharge to be paid in advance for early check-in of €25. This amount is non refundable, since we need to adapt our daily schedule to be of service. What is included for the guesthouse? Are there additional charges for the guesthouse? Drying service € 5 per load. Although we have 3 cats and 3 big dogs ourselves we do not allow pets in the B&B. A maximum of 2 pets are permitted in the guesthouse, free of charge, but need to remain on a lead when in the garden. You are obliged to clean up after your dog in case of droppings in the garden. You are liable for any damages caused by your pets. If you arrive with more than 2 pets there will be an additional fee of €10 per dog per day. French law requires you to keep your dog on a leash and clean up after your dog within city limits. Outside city limits.your dog is required to stay within 100 m from its owner. It is prohibited for your dog to chase wildlife and will be severely punished. Everything we serve is gluten free. Everything we serve is vegan a.k.a. plant based. Everything is homemade and, as far as possible, organic and local. If you have any dietary restrictions, other than vegan and gluten free, please inform us when you book and we will do our best to be of service. We have a number of special deals. While entering your date of travel in the booking form, and the number of nights you intend to stay with us, your options will become visible, as well as any extra options like dinner, a bottle of local wine or Champagne upon your arrival. For our Guesthouse we have a very interesting deal that can save you up to 45% depending on the lenght of your stay. Parking is possible in our enclosed parking area. At the moment we do not have a garage for you to park you Motorcycle. At the moment we do not have any bicycles available for our guests. You are welcome to bring your own and we can provide you with lovely routes in the area. We are located in the rural parts of the area. There is no public transport n the vicinity , so you need to come by car, motorcycle or bicycle. *We have numerous maps for you to enjoy the local scenery by foot or bicycle. *We are located in the midst of WWI and WWII battlefields and can direct you to American, German and French cemeteries and memorials. *You can enjoy the cultural highlights of Verdun, Reims, Sedan, Charleville-Mézières and even Paris. *Euro Disney is easily accesible per train from Reims. *In Exermont you can enjoy bungee jumping. *In summer you can go swimming in the Aisne. *In summer there are numerous flee markets on Sundays. *There a several festivals held around the year for you to enjoy and visit. *Bookings can be made per through our website, per email or phone. *At the time of booking we require 25% deposit. Booking is definitive when the down payment has been received. *The remaining 75% is to be paid in full upon arrival. *Any additional costs are due on the day of your departure. *The number of persons occupying the room must not exceed the number declared at the time of booking. *Check-in time is from 16.00 h until 21.00 h. We appreciate you informing us of your estimated time of arrival. *Early check-in is available on request. There is a non-refundable surcharge of € 25 to be paid in advance. *We require that you vacate the room by 10 h on the day of departure, unless otherwise agreed on and paid for in advance. *If, for compelling reasons, the booking needs to be cancelled you can propose a new date to postpone your reservation. Depending on availability this should not be a problem. *There is no refund of the down payment. *Aside from this, we would only cancel a booking if the room were unavailable for reasons beyond our reasonable control. In this case we ask you to propose a new date. These terms and conditions apply to all bookings made for Mostarlić Gluten free and Vegan B&B in Bouconville, France and its inventory. *This is a completely vegan and gluten free B&B. *It is prohibited to bring meat into the B&B or food that contain gluten and you are required to leave mentioned products in your car. *If you do not comply, an additional cleaning fee of € 100 will be added to your account daily for every day you ignore this house rule. Pets are allowed in the Guesthouse, but not on the furniture. *Children 4 years and older are welcome at our B&B, but must be quiet and well-behaved and respectful of the other guests, our animals and the property. In certain circumstances we are willing to make an exception on the minimum age. *Smoking is prohibited on the premises. *No candles and/or open fire are allowed due to fire and insurance regulations. *Parking is at your own risk at all times. *You can park your car on the street free of charge. *On request you can park your car at the parking. The gate will close at 22h, no exceptions. *We ask you to take all reasonable and proper care of the room and the property. *Any damages or breakages must be reported to the owner as soon as possible and paid for before you depart. *During your stay, you are responsible for the behaviour of all members of your party. *We ask you not to do or permit anything on the premises that might cause a nuisance to neighbours and to abide by all instructions from the caretaker as regards the use of the property. *We reserve the right to ask you and your party to leave the property without any refund if the behaviour of any guest is considered unacceptable. *We do not accept liability for any injury caused to persons or any loss or damage to personal property. *Our rental fee does not include insurance and we strongly advise that you take out suitable insurance cover. *We endeavour to ensure that everything is to your satisfaction during your stay. Should you find any faults or have any complaints, we advise you to contact us immediately so that any appropriate action can be taken. 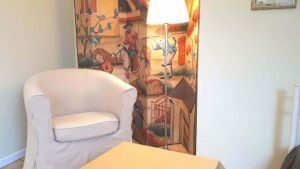 *Our B&B is situated in the rural surroundings of France, so life and expectations can differ from your home customs/habits and experiences such as small animals, slower internet, no cable/satelite e.g. We are not responsible for that and will not be a held accountable. *If the client continues to fail to comply with any obligation to which he is subject by virtue of the rental agreement, as a result of which the lessor is compelled to take judicial and/or extra-judicial measures, all costs incurred shall be for the client’s account, including the costs of legal assistance. As a region of forests, castles and ponds, the Argonne has it all; ancient cities, fortified castles and churches, WWI and WWII battlefields and monuments as well as local wildlife like wild boars, deer and birds of prey. You will find fresh fruit hanging from trees alongside a road, mushrooms growing in the fields, honey and local ciders, craft beers and vegan bubbly wine at our local producers…. The Argonne is a hidden paradise in the Champagne Ardennes. If you enjoy nature and like taking long walks we have lots of maps for beautiful hiking trips for you to enjoy. Because we are far away from the big cities Bouconville has a nocturnal purity of the sky, which allows an interesting observation of the celestial vault. Enjoy the stars with a nice glass of wine and watch the bats flying about at the same time! So close to the big cities yet far enough to enjoy the tranquility of nature, at Mostarlic B&B you can have it all. Only a hours drive from ancient cities like Verdun, Reims, Sedan and Charleville-Mézières where you can enjoy the cultural highlights and even Paris is just 2 hours away. We are located in the midst of WWI and WWII battlefields and can direct you to American, German and French cemeteries and memorials. The city of Verdun is certainly worth a visit. If you are interested in th Great war you should certainly visit the citadel of Verdun. The tunnels are dug under 16 meters of rock and Verdun, with its 26 medals, is the most decorated city of France. The Stg York Trail, where Stg York single handedly captured 132 enemy soldiers, is only 15 minutes away in Châtel-Chéhéry. The circuit starts at the town hall and is a very suitable walk to do with your dog or young children. Visit the most delicious local Vegan winery Clos de Gobu in Failaise. If you ring ahead you might be lucky and be shown around and see how they make this absolutely delicious bubbly wine from red currants by hand! Of course we also serve their delicious bubbly wine during dinner! There are a number of Champagne houses where you can visit the caves and learn everything about the Champagne process. Just tell us which house you would like to visit and we’ll help you on your way. Zig-Zag parc is a marvelous attraction if you have young children. It’s a 45 minute drive and well worth it if you are not into loud entertainment. enjoy themselves on the bouncy castle in full view you can lay in a hammock and relax! Euro Disney is a lovely parc to visit and getting there is not that hard. Domaine de Vendresse is a big playgarden for children 2 years and up and located 45 minutes from our B&B. Sedan is only an hour away and here you can visit the biggest fortified castle of Europe, which is certainly worth a visit. A guided tour with earphones takes you through the medieval chambers and every year a big medieval tournament is been held. At 75 minutes drive from Bouconville you will find the medieval town of Bouillon. High on the mountain is the fortified château of Bouillon, which was built before the year 988. It is worth a visit if you don’t mind the number of stairs and in summer they have shows with birds of prey. After your visit to the chateau you might want to stop at “Friterie the Beetle” at Quai des Remparts 21 where you can get gluten free and vegan chips! If you like to go skiing you can do so at just an hours drive from our B&B. Every two years around 250 troupes from five continents meet to present their creations to over 150,000 spectators from all over the world. For 10 days, the World Puppet Theatre Festival organises around 200 shows as part of the main event and fringe festival, street shows, meetings, exhibitions and other festivities. ** stands for tested by us, # means were not impressed ! If you are looking for property in the region you can contact Isabelle Leijn from Huisraad . She speaks Dutch, German, English and French. Would you like to know what our guests think of their stay? Our stay was not just a stay for a night, it was a vacation on itself. Samantha and Zoran created a slice of heaven for Vegan’s, Celiac’s and omnivores alike. Thank you for your hospitality! I had the privilege to try some of their food and I must say that I was happily surprised! Just delicious!! And they are like a warm blanket that makes you feel warm and very much welcomed. Love you guys! 😚 Thanks for everything! Hope to see you next year or so. We had a wonderful stay in a lovely room. The couple was very very nice and made us great breakfast with selfmade vegan cheese and gluten free bread. Also the 3 course dinner together with them was delicious. And on the top comes three cute dogs. There were no open wishes from our side! The staff here went above and beyond to help us. 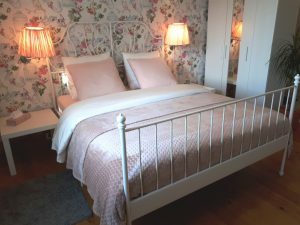 The B&B is in a perfect location to enjoy a tranquil sleep and a walk in the nature. Very good vegan and gluten free breakfast, perfect to stay healthy! La chambre bien le lit très confortable . la maison chaleureux on se sens bien comme a la maison. le repas était très bon excellent, propriétaire très sympa. J’ai tout aimai, je vous recommande! Logement agréable et des hôtes accueillants. C’est rare de trouver un herbergement avec petit déjeuner et repas vegan. L’accueil est chaleureux et familial, le petit déjeuner maison. Trevliga värdar fint rum god mat ! Bra sängar fräscht o fint. 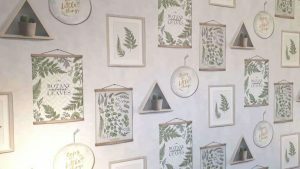 L’accuei Chaleureux, le confort, la propreté, la qualité des produits maison sans gluten et vegan, le calme, le rapport qualité prix. 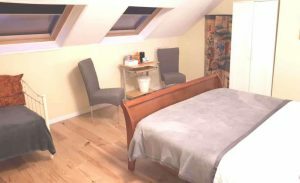 Très jolie gîte, bien agnecée, ideal pour un couple cherchant le calme, le repos. Très bon acceuil du propriètaires! J’ai passé une très bonne nuit, tout était parfait. Personnes très gentilles et agréables . This vegan, gluten free B n B is fantastic. Sam & Zoran are extremely helpful and keen to provide the most perfect room and food. We have stayed twice. Once in the guest house and once in a lovely downstairs room in the main house. Both are highly recommended. Lovely linen, coffee, tea and fruit provided. We also had dinner, breakfast and a picnic lunch. Each meal was perfect and there was plenty. Sam & Zoran freshly prepare every meal often using veg from there own garden Homemade bread, yogurt and cakes etc. If you traveling in north eastern France it is a great place to stay and enjoy wonderful vegan food. Pros: Great vegan food, Lovely rooms, Very welcoming! Would you like to leave a testimonial about your stay at our B&B? Please fill out the form below!